The Van Andel Institute, a LEED Platinum-certified cancer research institute in Grand Rapids, Michigan, is a flexible, phased-growth facility that encourages researcher interaction and can adapt to fit the changing needs of the research program for the private institute. An integrated team approach was taken in identifying sustainability goals early in the design process, providing a framework for the development of design solutions while always holding the client’s scientific research program as the primary overriding objective. Phase II of the project is one of a select few laboratory buildings in the United States to achieve Platinum certification level. Through computer simulation, energy modeling and analysis of real performance data generated from the existing building, the Phase II team developed both active and passive measures to reduce consumption and optimize performance to yield a direct energy cost savings of 20% over baseline national performance ratings per ASHRAE/IESNA Standard 90.1- 2004, earning a total of seven LEED credits in the Energy and Atmosphere credit category. 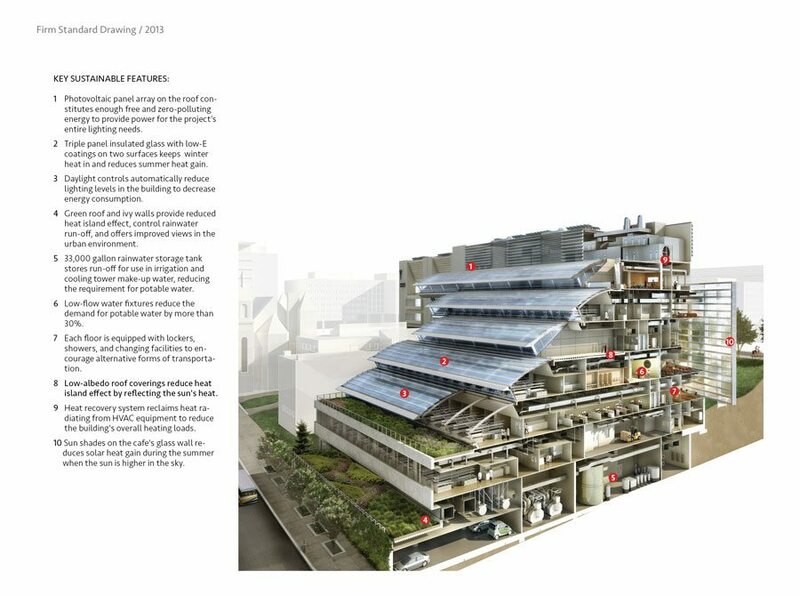 Some of the green features of the Van Andel Institute project are show in the axonometric section above.